Assisted living facilities flagged by the state for safety issues aren’t required to proactively reach out to residents’ family members to alert them about those problems, the I-Team uncovered. 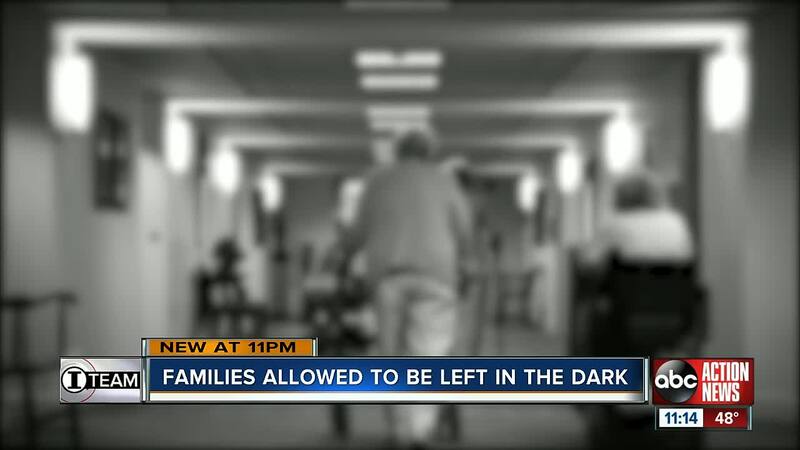 SUN CITY CENTER, Fla. — Assisted living facilities flagged by the state for safety issues aren’t required to proactively reach out to residents’ family members to alert them about those problems, the I-Team uncovered. I-Team Investigator Kylie McGivern found the gap in state law requires facilities to report any abuse and safety issues to the state – but not necessarily to family members or the public. The state’s Agency for Health Care Administration keeps records online at FloridaHealthFinder.gov for all assisted living facilities, including inspection reports and emergency orders. There are more than 3,000 licensed assisted living facilities in Florida. Since 2016, state regulators have hit 21 of them with moratoriums since 2016 – including six in the Tampa Bay area. The state issues a moratorium when there is “a threat to the health, safety, or welfare” at an assisted living facility. That order bans the facility from admitting new residents but allows it to continue operating after posting a notice of the moratorium at the facility. “So as opposed to forcing the facility to move their residents to a different location, those people are trapped,” said Sartes. Janine Marek removed her 96-year-old mother, Irene Faulhaber, from Inspired Living at Sun City Center after the state issued a moratorium at the facility in December for incidents of sexual assault and violent behavior by residents against other residents. Marek said she moved Faulhaber, who has dementia, to a new facility after three years at Inspired Living due to issues cited in the state report and falls her mother experienced at the facility. Marek also shared photos of her mother’s injuries with the I-Team. “I started taking pictures of her injuries because she was having a lot of falls – excessive falls,” said Marek. The state issued a moratorium for Inspired Living at Sun City Center on Dec. 5. Marek said Inspired Living never contacted her about the state’s findings. The I-Team reached out to the family members of dozens of other residents at Inspired Living at Sun City Center. Six said they received a voicemail from the facility nearly a week after the state issued its order. Four said they too were never contacted by the facility – including many who told the I-Team they only learned about the moratorium from watching the I-Team’s report last month. Victoria Francois, a certified home health aide who worked at Inspired Living before the state stepped in, called for more oversight from the state for assisted living facilities. “I think what needs to change is that the state needs to come into the building a lot more often than they do. And a lot more unannounced,” said Francois. The state inspects assisted living facilities every two years and while investigating complaints and monitoring those facilities found to be not in compliance with state law and regulation. Francois told the I-Team she quit her job at Inspired Living in the fall. In an email, Inspired Living told the I-Team Francois is a “disgruntled former employee” fired for excessive absences. Inspired Living submitted an improvement plan to the state last month. That plan shows its executive director left her job on Dec. 11 – the same day the I-Team first reported on the moratorium order at Inspired Living. But last month, Darren Richards, who works for Tucker/Hall, a crisis management firm hired by executives at Inspired Living, insisted on behalf of his client that Inspired Living at Sun City Center’s executive director resigned Dec. 3 and stopped working at the facility that same day – two days before the state handed down its moratorium order. Validus Senior Living, Inspired Living’s parent company, has declined multiple interview requests through Richards to speak with executives over the past several weeks. The I-Team also emailed all eight members listed as Inspired Living’s leadership team but has yet to receive a response directly. Inspired Living went on to state the three residents identified by the state for inappropriate behavior have been removed and insists the company called and emailed residents and their families about the moratorium. To check the number of status of assisted living facilities in the Tampa Bay area, click here .